Who benefits from welfare programs in the United States? You might think this would be easy to answer. 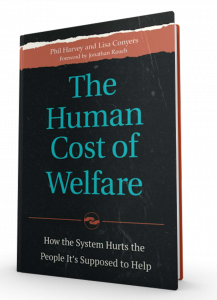 But as Phil Harvey and Lisa Conyers show in their recent book The Human Cost of Welfare, it’s actually quite complicated. In their detailed yet accessible exploration of America’s welfare system, Harvey and Conyers aim to show how well-meaning programs hurt the very people they’re designed to help. After talking to welfare recipients living in tent cities in Seattle, on native reservations, and everywhere in between, the authors come to a worrying conclusion. People receiving benefits feel they lack control in their lives, miss working and the fulfillment it brings, and find the welfare system to be impersonal, confusing, and often insulting to their dignity. The book is broken down into four parts, which lay out the argument for the importance of work in the following way. One point of particular note is the way in which companies like Walmart have colluded with government actors to provide workfare programs to welfare recipients. These programs have little intention of helping the recipients find full-time work long-term. Rather, they’re a great way for Walmart to get labor at a much cheaper cost than paying the going market wage. Part II is entitled “The Counterproductive Qualifications for Welfare” and delves into exactly who is receiving what under the current system. Chapter 4 examines the various ways in which family dynamics are affected by welfare programs and the incentives they create. Another interesting insight from this section is the way in which single adult men – who make up a disproportionately large part of the U.S. homeless population – are underserved by the welfare system which aims to help children and their mothers the most. Part III gets deep into policy, examining each major welfare program and noting the ways in which reality differs from what was imagined by the programs’ architects. This section also returns to the question of who receives benefits, focusing on the recent push by the Obama administration to get more people on food stamps – an effort that went so far as to pay recruiters to sign up decently well-off college students for SNAP benefits. Chapter 6 outlines how housing programs have come to benefit well-connected or better-off people to the exclusion of the very poorest. The authors note that “41% of those who receive public housing assistance have incomes above the poverty threshold.” Chapter 7 explores SNAP benefits (food stamps) and Chapter 8 the WIC program for new mothers and infants. Chapter 9 turns to disability welfare programs and the ways in which they discourage the disabled to work – even when they can and would prefer to. The authors relate the story of Joe, a disability beneficiary who was injured in a truck accident. Now living with chronic pain, he knows he could make some money part-time “on his good days” but, thanks to the rules around transitional work, he doesn’t pursue these opportunities because he’s worried about losing everything. The next chapter discusses Medicaid and the Affordable Care Act, which has further complicated an already a convoluted system. The authors paint a picture of a system designed more for the benefit of insurance companies, doctors, and bureaucrats, than for those served. Finally in this section, Chapter 11 tackles the Earned Income Tax Credit. This program garnered a lot of attention as a pro-work answer to earlier concerns about the social safety net, but it has now become confusing and fraud-ridden instead. While the authors offer a number of policy ideas, the unifying theme is helping people return to work. They see a role for some federal programs, but generally favor experimentation and localization as a way to address fraud and abuse and to reduce the complexity of these programs. One idea that will be of particular interest to libertarians is the call to privatize welfare. Here, the authors note that a local approach addresses real needs better and that in America, charitable giving already exceeds $300 billion annually. If more of this money could be used to address true poverty, it could achieve the goals of current programs without offering as many incentives to paper pushers and others to make themselves rich by keeping people poor. You can order a copy at a publisher’s discount at humancostofwelfare.com.